It wasn’t one of the smartest things I’ve ever done. 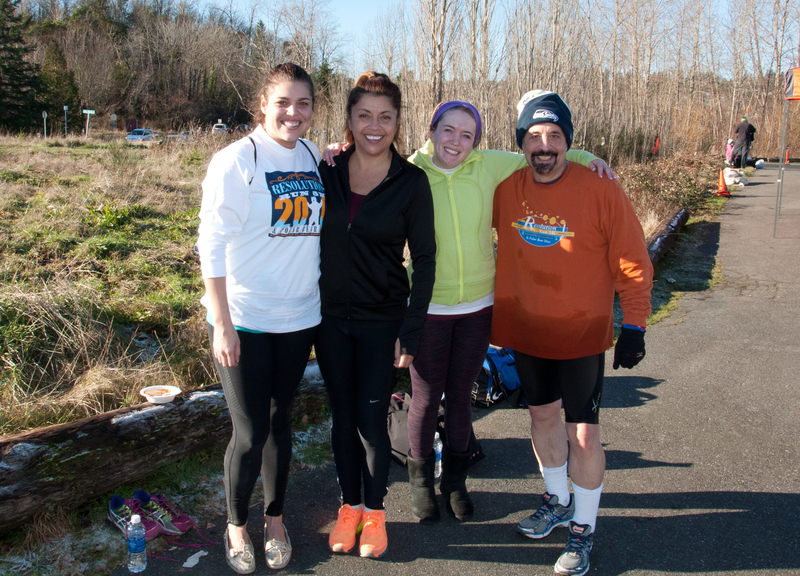 I ran the 2016 Resolution Run 5K & Polar Bear Dive last Friday (Jan. 1), and waded through the waters of Lake Washington, after coming down with a cold. I’d signed up in advance for this event — and to do the Polar Bear Dive for the first time ever after running the “dry” Resolution Run 5K 10 different times — and had urged several friends at Allytics, where I work, to do it with me. When they said they would, I felt committed. Still, after tossing and turning in bed overnight and feeling the onset of the cold that my wife, daughters and colleagues at work already had, I got up Friday morning and pondered for several minutes on my couch whether to risk doing it. I was torn. I was also feeling very sick. But when I got up from the couch to make coffee, I felt a sudden surge of energy. I got dressed, ate, and headed to Seattle’s Magnuson Park for the run. The Allytics team (minus one): Sarah Pevey, Jeannette Leiva (Sarah’s mom), RJ Ricker, and me. Going into Lake Washington just before the finish line of this race, as the course requires, complicates things. Never before had I needed to bring a second set of clothes to a race. But I had them all packed and ready Thursday night. My work friends, for the most part, had indeed showed up for the race. At the starting line, I was feeling OK, but just hoping to get through it. Here’s where I start complaining. This is a great event, and I look forward to doing it every January 1. Some 1,400 runners and walkers participated (of which 800 did the Polar Bear Dive, the rest the dry run) — a strong turnout for New Year’s Day. But the organizers must do something about the dangerous icy spots on this course by putting down sand or salt in places. This has been a recurring problem in recent years. I’ve avoided a spill myself, but sooner or later someone is going to suffer a serious injury and file a lawsuit. There were numerous slick spots along the trail in the second and third miles of the course and again near the finish line. As a result, I ran carefully, and very gingerly around those icy spots. There is a lengthy straightaway section in the last mile of this course where I usually try to pick up my speed. This day, I did the best I could while watching where I ran. 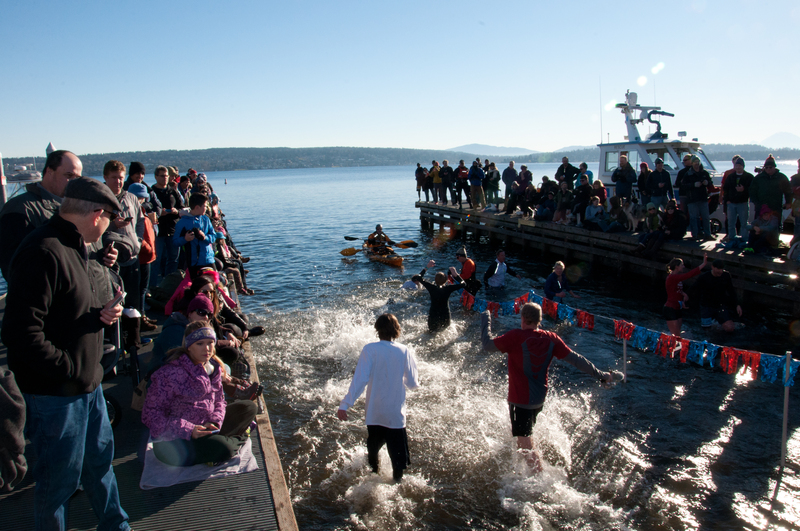 Polar Bear Dive runners all enter the shores of Lake Washington at the three-mile mark for a 100-foot romp into the water. Then they come out and go another 300 feet or so on pavement to the finish line. I’d worried previously about how the sudden chill of the water would affect my body. Yes, I am a wuss. I’d been a chicken to do this. But in Friday’s run, as I approached the water, it felt very manageable. I realized that I could wade through and not even get my head and shoulders wet. I already had a cold; why should I make it worse by getting my hair wet? (Remember, I am a wuss.) So that’s what I did — waded through water that was a bit more than waist-high. And it wasn’t even that cold! It wasn’t that difficult to get through the water, though I had to navigate my way around the corner where you turned back inward, and I believe I told a woman just standing there to let me by. Once out of the water, I had to find the left turn to the finish line. It was about a tenth of a mile away, but that tenth was a wet, icy stretch — dangerously so — caused by the frozen drippings of wet runners coming out of the lake. I finished upright and did not catch pneumonia. Yet, I was nonplussed about the Polar Bear Dive. Why was I ever chicken? I finished the event in 39:32 (12:45 per mile). That would be slow for me for a normal 5K (I ran 35:46 in the “dry” Resolution Run last year, have a post-ankle surgery best of 34:29 in 2014 and an overall PR of 24:32 in 2005). But the Polar Bear Dive is naturally slower with the water portion. And the icy course also slowed everyone down. I had teammates at Allytics finish both ahead of me and behind me. Five of us ran in the event, including RJ Ricker, Jamin King, and Sarah Pevey and her mom, Jeannette Leiva, who is visiting Sarah from her home in Palm Beach Gardens, Fla. It was great having them there. Congrats, you guys! I must shine the spotlight again on Jamin again. 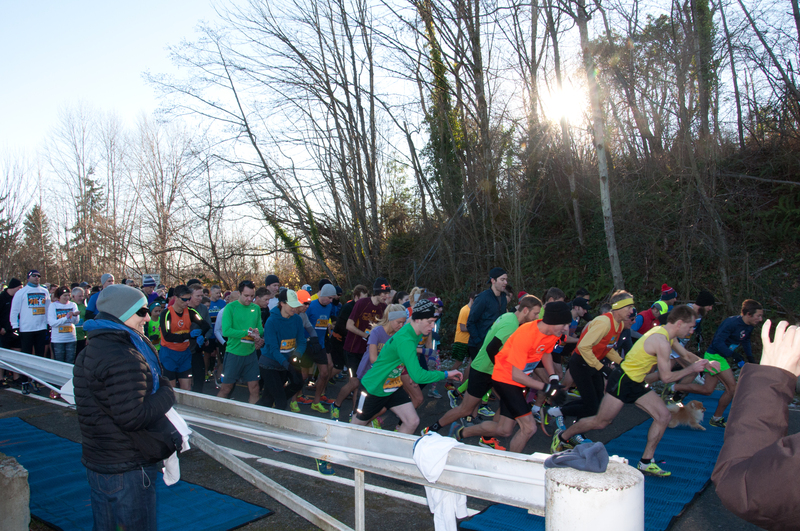 I wrote about him in my last post — he finished seventh in last month’s 12Ks for Christmas 12K run in the Kirkland. 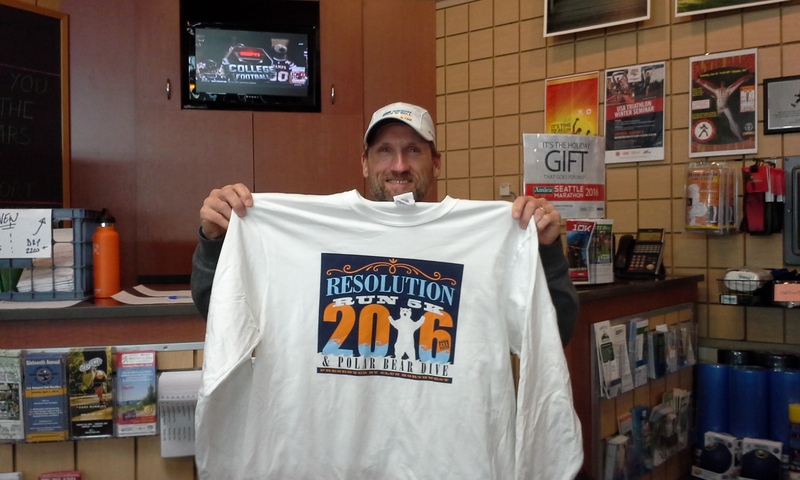 He ran the “dry” version of the Resolution Run 5K and won it all. Yes, he finished first in a fabulous time of 15:48 (5:06 per mile). Great job, Jamin! Full results are here. This was my 190th race overall, so I am looking forward to reaching 200 in 2016. The next race I plan to do is the Valentine’s Day Dash 5K at Green Lake, which this year is on Valentine’s Day, February 14. After that, it’s a switch to bicycling for the annual Chilly Hilly ride February 28 on Bainbridge Island. Need to get some bike rides in during the month of January. Note: Congrats to Microsoft/runner friend Jen Gaudette for finishing third in her age group and 19th overall in the Polar Bear Dive! This entry was posted in 12Ks of Christmas, 5K, Bicycling, Chilly Hilly, Resolution Run 5K, Running, Valentine's Day Dash and tagged 12Ks of Christmas, 5K, Allytics, Bicycling, Chilly Hilly, Lake Washington, Magnuson Park, Polar Bear Dive, Running, Valentine's Day Dash. Bookmark the permalink. Great blog post, Monte. I can start training now for the next 5k and will join you on your run!